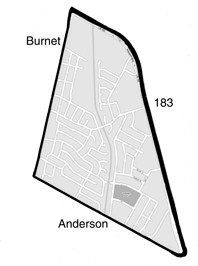 The Wooten neighborhood in north Austin, Texas, is a triangular area bounded by the commercial corridors of Burnet Road to the west, Anderson Road to the south, and 183/Research to the north and east. Neighborhood population was listed in 2005 at just under 6,000. Schools include Wooten Elementary and Burnet Middle schools (both AISD) and Redeemer Lutheran School (Private). Wooten Park sits adjacent to the two elementary schools. If you’re thinking of buying in Wooten, we recommend Redfin to browse for homes.